Santorini beaches.. A lot of Santorini visitors believe that there aren’t any, except the famous Red Beach. Wrong! At Santorini, probably the most spectacular island in Greece and even Mediterranean, there are 17 of them. What characterises beaches of our island is their volcanic origin. Colorful rocks, pebbles and sand, black, white and red are the most popular on Santorini beaches. 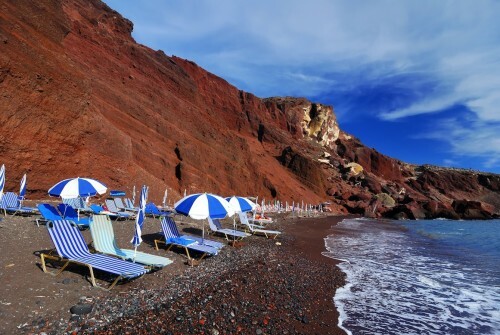 Red Beach is one of the most famous beaches in the world and one of the best Santorini beaches. Red Beach is located on the southwest coast of Santorini, 12 km from Fira, the capital of the island and 23 km from Oia village. Red Beach took its name from the red color of the rocks that surround it, and the impressive scenery is completed by the black volcanic pebbles that make up the beach. The Red Beach is not organized, although there are some umbrellas and sunbeds but rarely one can find a free one to get comfortable. For this reason we suggest you arrive early at the beach. Also be aware that even space for your beach towel may be hard to find due to crowds. You can take your diving mask with you, as the underwater rocks are also impressive! Also be ready for high temperatures in Red Beach. Because it’s protected from northerly winds, there won’t be any refreshing breeze. A visit to Red Beach can be combined with an exploration of the archaeological site of Akrotiri where the famous ancient settlement was discovered, buried under the volcanic ash. To reach the Red Beach, you can park your car next to the archaeological site and continue on foot, about 10 minutes, or by boat from Perissa. There are also local buses that are transferring tourists and locals to the beach. Perissa is one of the best Santorini beaches. Located 13 km from Fira, the island’s capital, is the longest beach of the island and the natural continuation of Perivolos. Perissa is situated on the southeastern coast of Santorini and therefore its protected from strong summer northern winds, and its water is almost always calm. The two main features of Perissa is the black sand which extends along the beach and the impressive rock of the Prophet Elias, also known as Mesa Vouno, with white color. The choices of water sports are numerous as there are many centers that offer options for every taste, from simple sea kayak to jet ski. The beach water is crystal clear, you will find many umbrellas and sunbeds number of which is insufficient only after the mid-season. The area of Perissa can be characterized as a tourist resort. Here you can find hotels, from a simple one like studios to luxurious resorts, taverns, restaurants, beach bars, and other tourist facilities. Within walking distance of the beach, there are the ruins of Ancient Fira, which you must visit. You can get to Perissa by using the local bus line. Kamari beach is located 8 km from Fira, on the southeastern coast of Santorini. The characteristic of this beach is also black volcanic sand. In ancient times Kamari was one of the most important settlements of Santorini. Today it is a tourist resort with facilities of all kind. Kamari beach has crystal clear water, umbrellas and sunbeds, water sports centers and beach bars. That is why it’s very popular among Santorini beaches. In Kamari there are hotels of all categories, rooms to let, rental villas, taverns and restaurants serving fantastic local cuisine dishes, bars and night clubs. Also in Kamari, every year is organized Jazz music festival. Near Kamari, there is an archaeological area of Ancient Fira which we recommend to visit. Also, in the chapel of Zoodochou Pigi, just 30 minutes by foot from Kamari, is a spring with fresh running water. To get to Kamari you can use the local bus line. Perivolos is the cosmopolitan beach of Santorini. It is the natural continuation of Perissa beach with volcanic black sand and crystal clear water. The beach is equipped with umbrellas and sunbeds, in some spots bed size, water sports centers with almost all options and beach volley corts. Along Perivolos beach you will find taverns and restaurants with excellent cuisine, beach bars which are gathered on the beach are considered as the best in Santorini and they organize different events, such as beach volley tournament, etc. Vlychada beach is located on the southern coast of Santorini, just 11 km from Fira, the capital of the island. Vlychada also consists of black sand, it’s organized with sunbeds and umbrellas and it has crystal clear water. To Vlychada there are no local bus services and that makes the beach more quiet and relaxing. The white rocks in the back of the beach, which extends along its length, make Vlychada one of the most impressive Santorini beaches. At the east end of the beach there is a beautiful port at which traditional boats called Kaiki are anchored and it is also a place where sometimes ducks and swans make their appearance, well known port visitors. In the Vlychada area there is Santorini Arts Factory, a great venue, which once housed tomato plant. In Santorini Arts Factory, various events are organized every year. Also in the area you will find a museum of the famous Santorini tomato. Vlychada also hosts one of the most spectacular beach bars in Mediterranean, which you can visit after a long day at the beach. White Beach is one of the most spectacular among Santorini beaches. It consists of black pebbles and on the back side of the beach there are impressive white vertical rocks, of which the name of the beach was born. The white beach is not organized and therefore we recommend that you have with you all the necessary supplies, like water and snacks. This unique place is located on the southwest coast of Santorini, next to the Red Beach. Access to the White Beach is only possible on foot, following the path from the Red Beach, or by boat departing from Akrotiri. Combining swimming in Red and White beach, you will be completely satisfied with your daily tour. Monolithos beach is located on the east coast of Santorini, 7 km from Fira, near the airport. The beach is organized with umbrellas and sun beds and it attracts mainly families with children. For this reason, the area of Monolithos is considered a small family resort. Also in the area you can find basketball court, football field, beach volley court and playground. Within walking distance of the beach there is tourist infrastructure. Restaurants and taverns that serve fresh fish and seafood, hotels and rooms to let make the area of Monolithos attractive to Santorini visitors. The beach of Agios Georgios is the natural continuation of the of Perivolos beach on the south coast of Santorini. It is located 12 kilometers from Fira and the whole area is a tourist resort. The beach has crystal clear water and stunning black sand. It’s organized with umbrellas and sun beds, a wide variety of options in water sports for all tastes and ages. Along the beach you will find beach bars, taverns and restaurants, and many options for lodging that meet the needs of all visitors. However, Agios Georgios is considered as the quiet spot of the coast, which is preferred for relaxation. To get to Agios Georgios, you can use the local bus line, either from Fira or from the other beaches along the coast. Columbo beach is located 8 km from Fira, on the northeastern coast of Santorini. The characteristic of Columbo are the vertical cliffs in the back but also the fact that it is one of the few Santorini beaches which has remained unspoilt and undeveloped. Avoid visiting Columbo during days with strong northern winds because the beach is not protected. Due to the lack of infrastructure on Columbo we recommend you bring with you all the necessary supplies and especially water and sunscreen. It is worthy to know that about five kilometers east of the beach is underwater volcano crater, which erupted in 1650. To reach the beach you have to walk a short distance from where you park. Mesa Pigadia beach is located in Akrotiri area, 14 km from Fira. It consists of black sand, pebbles and large stones thich are at a sufficient distance from the shore. At the back of the beach there are sharp rocks where Santorini inhabitants have sculpted spaces to hide their small fishing boats. It’s quite impressive. On Mesa Pigadia beach you will find a limited number of umbrellas and sunbeds and a tavern. The beach can be reached by car via a dirt road. Exo Gialos beach is considered as the beach of Fira which lies just 2 km away. Located on the eastern coast of Santorini, it is a quiet place, only partial organized with a few sunbeds and umbrellas, black sand and deep water. South of the beach, there is a picturesque harbour which is home to the traditional boats, which is worth visiting and taking pictures as at the back there are impressive vertical cliffs. Vourvoulos beach is a secluded place on the north eastern coast of the island, 4 km from Fira. Vourvoulos is recommended for relaxation, away from the crowded Santorini beaches. Vourvoulos is not organized as it is unknown to visitors of Santorini. Because of its positions this beach is exposed to northerly winds which bring big waves to shore. In some parts of the beach you will find sand for more convenient sunbathing. Nearby there is a tavern which serves fresh fish and seafood dishes. Almira beach is located in Akrotiri, on the southwest coast of Santorini, 10 km from Fira. It’s within walking distance from Vlychada and it is a quiet place for relaxation. Despite its beauty, is not particularly known to visitors of Santorini. The beach is not organized and consists of pebbles and crystal clear, calm water. It’s accessible by a dirt road, in the back side of the beach there are a striking rocks, which resemble sculptures. Almira hosts a tavern which almost touches the sea. If you decide to Almira, we recommend you have with you the necessary supplies like water and snacks. Gialos is a remote beach on the northeastern tip of the Akrotiri, 14 km from Fira. You won’t find any sunbeds or umbrellas on the beach because it isn’t neither organized nor well known. What makes Gialos unique is the absolute quietness, black pebbles with red cliffs behind the beach and the stunning view of the Caldera. To reach Gialos, you need to walk about 10 minutes from the parking lot and you must have with you the necessary supplies. The Akrotiri Beach is located in southern Santorini within walking distance of the Akrotiri village. To reach the beach you must first enter the village of Akrotiri. It is a quiet and unique beach as it has impressive view across the Caldera cliffs of Santorini. It consists of black pebbles and deep, cold water. After the bath you can try the traditional dishes of the island in one of the nearby restaurants. Baxedes beach is located in northern Santorini, just 4 km from Oia. The beach consists of black sand and is one of the largest in northern Santorini. Baxedes is mainly visited by locals and it is suitable for those who wish to avoid the crowds and prefer quiet swimming and sunbathing. Nearby there are other beaches that you can visit after or before Baxedes. In the area there is a limited number of rooms to let and taverns. We recommend that you avoid visiting the beach during the days with strong northern winds because due to its positions, high waves are created. Pori beach is located in northeastern Santorini, 5 km from Imerovigli village. It is quite secluded place and on the beach there is a similar red color as in the Red Beach. In Pori there is a small port used by fishing boats, which supply the nearby taverns with fresh fish and seafood. It is the place for those who are seeking the combination of relaxing bath and fresh sea food with unlimited view of the Aegean Sea. The beach is not organized.